We are a local family run Hog Roast caterers in York, delighted with the quality of our food and the awards received in recognition of it. 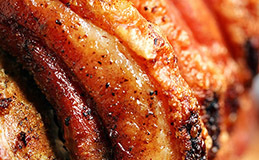 Delicious York hog roasts from our York free range hogs, slow roasted with marbled tender and flavoursome pulled pork meat and also really good crackling. Winners of the Prestigious Good Pig Award 2012 our free range hog roasts from York are perfect for any occasion, party or corporate event. Our hog roast York catering service will be the best hog roast you will have ever tasted. Our BBQ Caterers are perfect for any occasion, party or event. Using free range pigs bred near York to produce our quality sausage range and only 100% outdoor reared beef going into all our handmade burgers this really is scrumptious outdoor food for any occasion and with fantastic menus we are sure to have one that suits your occasion and budget. 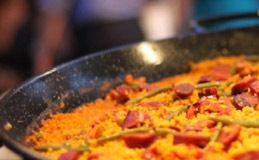 Big Pan Catering is becoming a very popular choice of catering, choosing from our authentic Spanish Paellas or traditional Mexican Chilli to our Moroccan Lamb and more. Your guests get to see the menu made right in-front of them absorbing all the sizzling and smells of the ingredients coming together in one big pan before being served straight from the pan to the plate. Call our wedding caterers today and feel free to discuss your requirements with us and we will tailor and blend our menus together to create a bespoke menu for you, as we strive to meet the needs of each and every bride and grooms needs and budget. 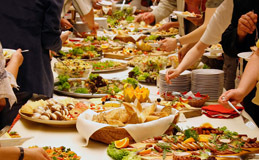 We supply a high quality, stylish and professional wedding catering service throughout Yorkshire for weddings and the evening wedding celebration and have done so for many years. Hog Roasts York are local free range award winning family run specialist outside event caterers specialising in York Hog Roasts. We provide top quality free range slow roasted pulled pork York hog roasts and free range BBQ catering to the York area. Catering for any type of event, function or occasion feel free to contact our friendly team today. We are also expert Wedding caterers and are extremely popular, often catering Weddings in-and-around York. If you are looking for York Hog Roast caterers to make your wedding or event extra memorable, then look no further than Happy Hogs & Hog Roast caterers York. Based near York, our Hog Roasts and York Hog Roast BBQ Caterers serve the beautiful city of York and its surrounding area with our amazing slow roasted pulled pork catering services. Our Hog Roasts York caterers only believe in using well-bred free range meat. We are sure to both make your mouth water and wow guests with our amazing free range hog roast hire service. We work all over the York and Yorkshire area at many different venues, always helping to make informal dining a relaxed and enjoyable experience for some of the most important times and special occasions of our lives and what better way to that then with exceptional slow roasted free range hog roasts York. Our York Hog Roast barbecue caterers provide tasty free range special breed hog roast menus to suit all occasions and events. Along with an amazing and delicious range of barbecue menus with our flaming BBQ delights, from Ribs, Pulled Pork, Brisket, Jerk Chicken, Burgers and so much more together informal packages that are all great value will help to make your York wedding dreams come true. We will work to meet your needs, by adapting our menus for weddings, christenings, formal, business and any other sort of event to suit you and your guest’s requirements. 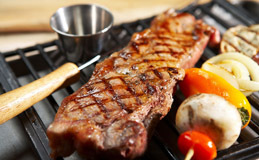 Barbecue food is cooked and served in front of your party guests, giving a real talking point and unique fun experience. We are told our hog roast hire in York is exceptional. From the professional polite uniformed staff that have both experience and food hygiene certificates, to award winning elite quality free range hog roasts and free range meat that we use in all our menus. Our York Hog Roast Wedding Caterers team always prepare food in clean professional premises, regularly inspected by the Environmental Health Officer (EHO) and maintain a 5 out of 5 star rating with full public liability insurance. Our clients can relax and enjoy themselves at their wedding, event or party knowing that “we actually do what it says on the tin”, and that they are in safe hands – perfect for a wedding and we’ve never let anyone down. Our York wedding and event catering team not only prep, cook and serve – they even clean up and do the dishes after the event! Our talented team of dedicated York Hog Roast and barbecue event caterers work all year round. Creating delicious and exciting menus that can be carried out in just about any surroundings and for any occasion in and around the York and North Yorkshire area. Our crisp free range hog roasts are cooked to perfection and are the closest thing to culinary heaven we can think of as we bring out the amazing flavours of our elite award winning free range pigs and prepare some of the finest meat for our special BBQ menus which is why our customers keep coming back to us over and over again for some of the finest hog roasts and barbecue catering food ever tasted in Yorkshire. No event is too big or too small to book your York event caterers today and call our hog roasts York team to discuss yours. Copyright © 2019 | Hog Roast Hire York and Barbecue Caterers York, Specialist Free Range Hog Roast and BBQ Caterers York. Hog Roasts York Caterers. Award Winning York Hog Roast Wedding Catering and Event Caterers.